The Acer Spin 7 features a powerful Intel i7 processor that allows for more performance when doing daily tasks. The 360° hinge allows you to enjoy 4 different modes while the rich full HD 14" IPS display gives you a crystal clear image. The 8GB of memory and 256GB SSD ensures you never run out of performance or storage space. The password-free Windows Hello gives you the fastest and most secure way to unlock your device. Acer Color intelligence technology dynamically adjusts gamma and saturation in real-time, optimizing colour, brightness and saturation without clipping and over saturation, these components allow for a more vibrant viewing experience. 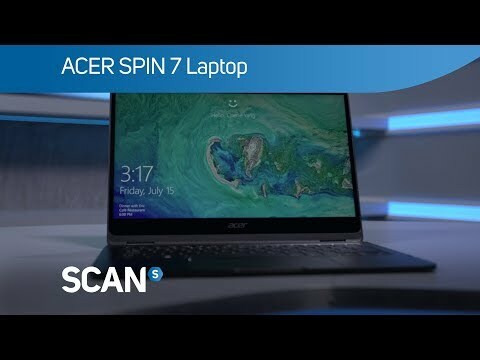 The Acer Spin 7 has a battery life of up to 8-hours allowing you to keep your device at your side for the entire work day without having to charge it once. You can revel in the epitome of sound with the Acer Spin 7, it utilises premium sound with Dolby Audio Premium which is coupled with Acer TrueHarmony which use a paper cone that offers a more accurate sound and fuller-bodied audio. This technology can auto reverse the channel output based on the screens orientation. Two USB Type-C ports give you the power to expand. While each can supply power and data transfer. Can I upgrade the SSD to 512GB? Hi Guys, In your technical opinion would it be possible to upgrade the SSD to 512GB on this device? It&rsquo;s a standard M2 port, but I wondered if being super thin would make any difference as acer may use a SSD size which can only provide 256gb storage?